Oops. I realized that I didn't actually circle back and post the third recipe from the giant brewday last week. No worries - it was a 10 Gallon Southbound and Brown Ale batch. I've made it a ton. So, you can get the recipe links here. At this point, the beer is a week old and all the furious bubble bubble pop has settled down. I'm going to let everything settle another week and then I'll bottle SOMETHING and rack the other three to secondaries in succession (yeah, I'll probably bottle half of the brown ale, since I've got 10 gallons). OK I have never done hard cider before, but that was enough reason to try. So here's what I did - and keep in mind I got lots of the ideas from the Making Homemade Hard Cider site. I upped the scale from them, though. I couldn't find enough of the right kind of juice, and thought blending might give me an interesting approach, so that's what I did. 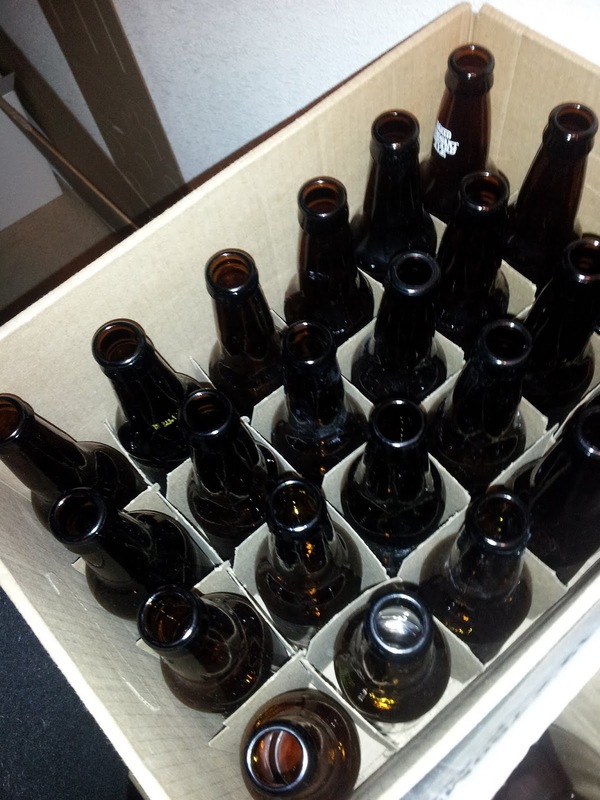 Then I'll wait a few weeks, rack it to a secondary, and then after some settlilng, it will be time to bottle. So I have reached a sad state of affairs. I'm out of homebrew. Well, not completely out, but with only about 4 bottles mixed between stout and that "turned out too dark brown Irish Red" - functionally, I'm out. I DO have another five gallons of the Irish "Brown" in a carboy ready for bottling, but nary a drop to drink. Oh, and while my mead from a few years ago has aged quite nicely, it is not a session beverage in the slightest. It is this utter dearth of beverage that caused me pause to consider - how much could I possibly have at once? Given that I only have five gallons in any state of progress, how much could I actually max out? Turns out, the answer is about 50 gallons. With 4 carboys, 2 kegs, and 8 cases of bottles, I do have room to produce and store a quarter of my limit at once (limit in the U.S. for those playing at home is 100 gallons a year for an individual of 200 gallons a year for a household with two or more individuals over the age of 21. More adults does not increase the personal consumption limit above 200). Now, were I to be maxed out, I would run into a consumption bottleneck rather than a production bottleneck, but that's a problem I could try to work through. Since I'm not FULLY keg capable yet, we'll call my maximum capacity 40 gallons - which means with only 5 gallons I'm at a meager 12.5% of my available load. With one day off of work (today), the question was, how do I pump so much into the front-end of the production line that I fill up more more more of that capacity to last me throughout the summer. The answer? A 20 gallon brewday. Now, while I could theoretically start at 7:30 AM with boiling and mash in around 8:30 with the first of two 10 gallon batches, that just wouldn't be my lazy procrastinative style (yes, I think I made up procrastinative, but I like the way it rolls). Rather, I didn't truly PLAN to brew until last night, meaning that I don't actually have any ingredients, which also limits my start time, since my Homebrew store of choice does not open until 10:00. This leaves me with the dilemma that there is no way to do two 10 gallon all-grain batches by a reasonable time this evening. So I made some plan adjustments. The new plan is: one 5 gallon batch of something experimental (I'm trying a Black IPA or CDA or whatever you want to call it), that I will source primarily with extract. Then one 10 gallon batch of a standard (we're doing the American Brown). Then, for my last trick (after clearing a carboy by bottling), I will be attempting 5 gallons of hard cider (another test, using some tips from this site). After all that, I'll have 5 gallons bottle conditioning and 20 gallons fermenting. 62.5% of my carrying capacity of 40 gallons. Much much better. One more 20 gallon (double 10g batch?) psycho-brewday in a month or two and I'd be loaded up for the rest of the year, most likely. 8:45 AM Buy Apple Juice?